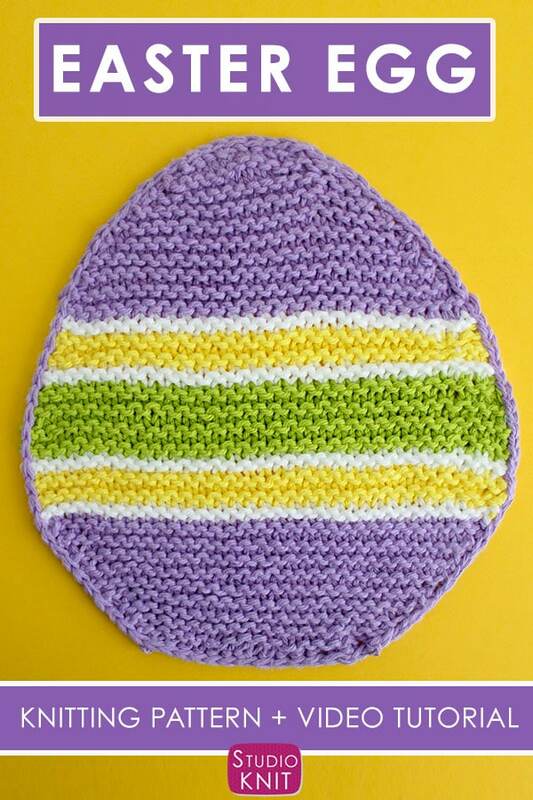 This colorful Easter Egg Dishcloth Knitting Pattern is a fun project to make in a variety of sizes. 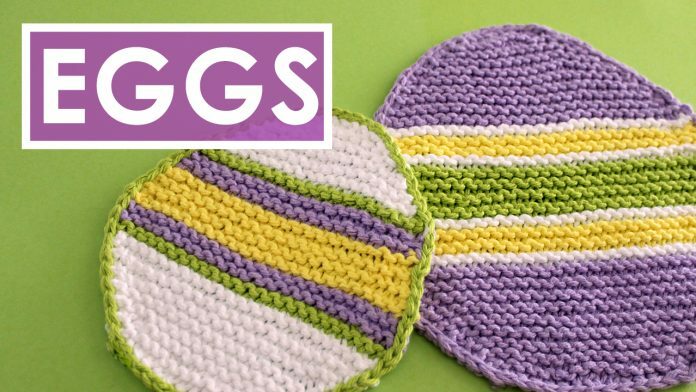 You can get really creative with your knitted Easter decor by making these garter stitch egg shapes into pennant banners, table decor, drink coasters, party trivets, potholders, and hot pads. It’s an easy quick-knit, so it’s a perfect last minute Easter knitting pattern. 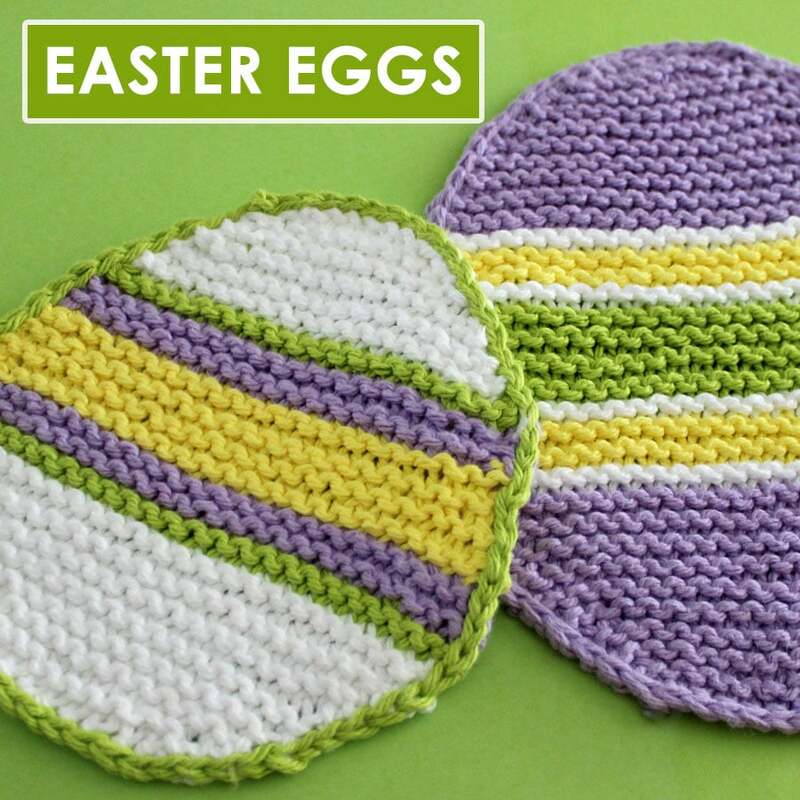 Design your own Easter Eggs with different colored stripes and embroider some, too. Cotton is my yarn of choice when knitting up items that will get wet like dishcloths or washcloths. 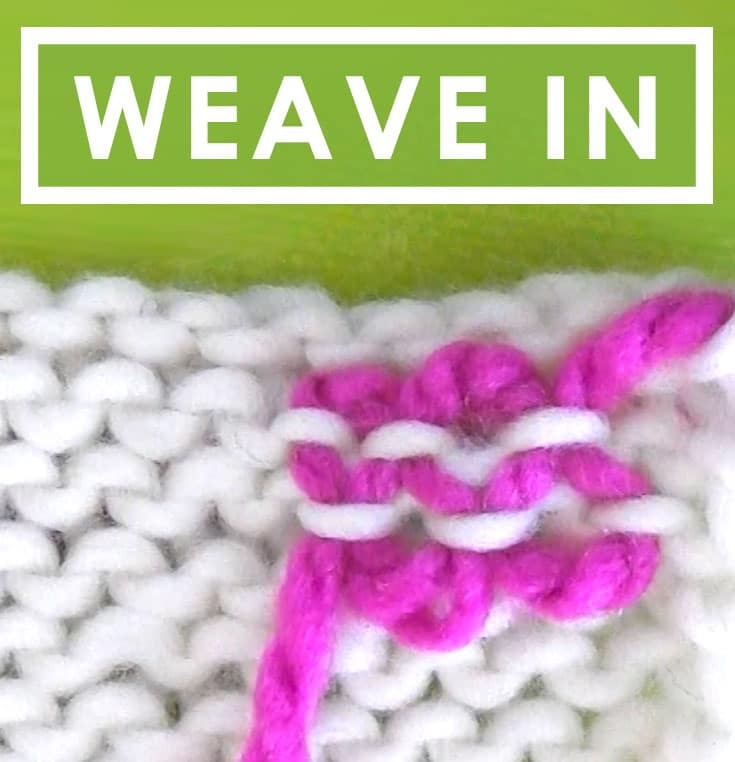 This pattern includes two different sizes created on straight knitting needles and I demonstrate all of the basic knitting techniques from my free written pattern in my video tutorial further below in this post. 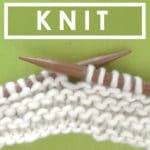 Let’s knit it up! WANT THE PATTERN ON THIS WEBSITE PAGE? Keep scrolling, it’s up next! 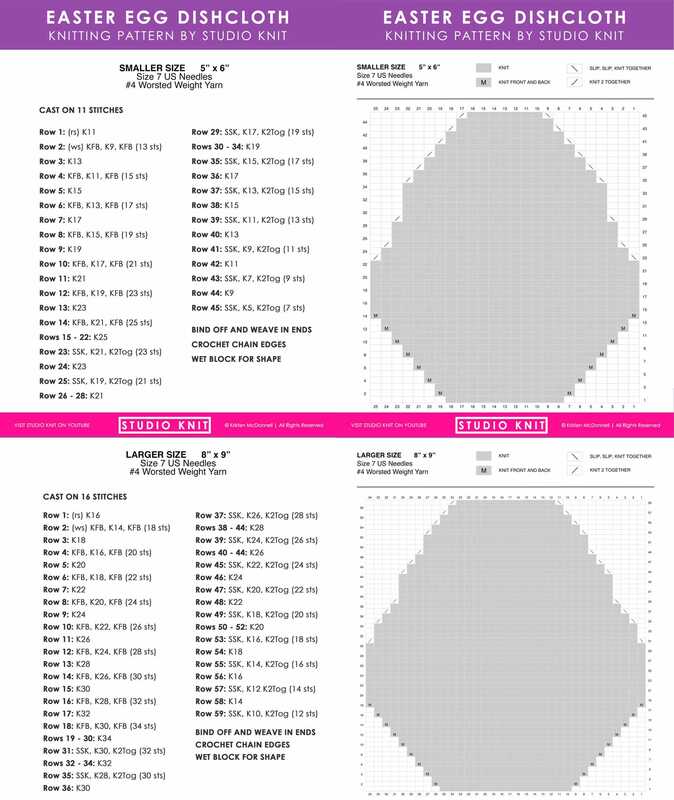 EMAIL SUBSCRIBERS: Download Your Ad-Free Printable .PDF Pattern + Chart. 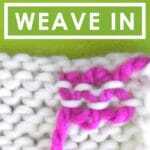 You will receive an email invitation to my “Knitting Freebies” page. 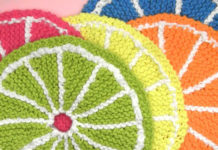 Feel free to use any sized yarn and appropriately sized needles for this project. 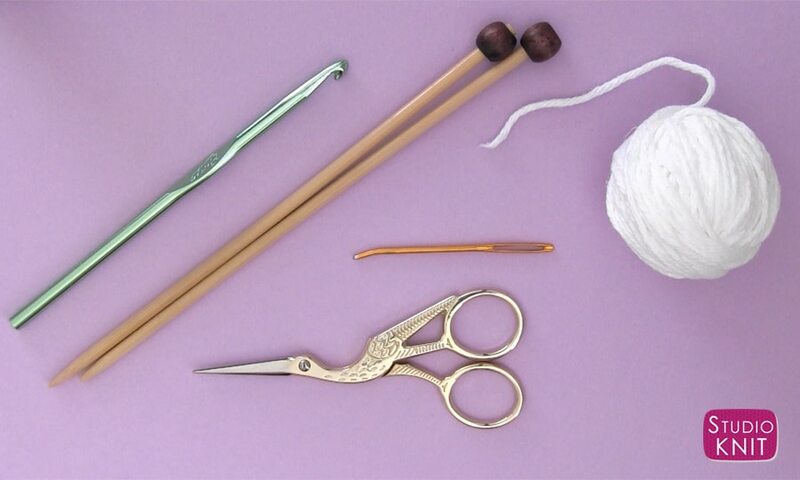 To achieve my sample sizes, I used size 7 US knitting needles with worsted weight yarn. 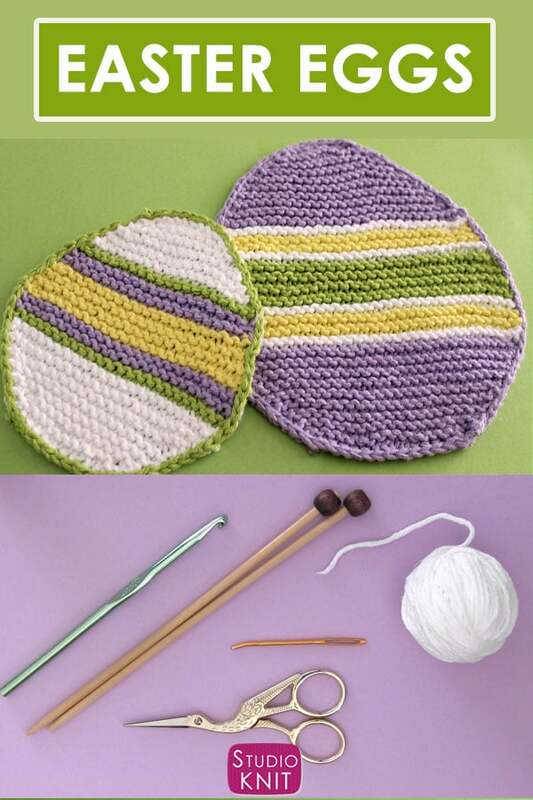 • Yarn in cotton worsted weight – I knitted my samples with Sugar N Cream cotton yarn in colors White, Soft Violet, Hot Yellow, and Hot Green. 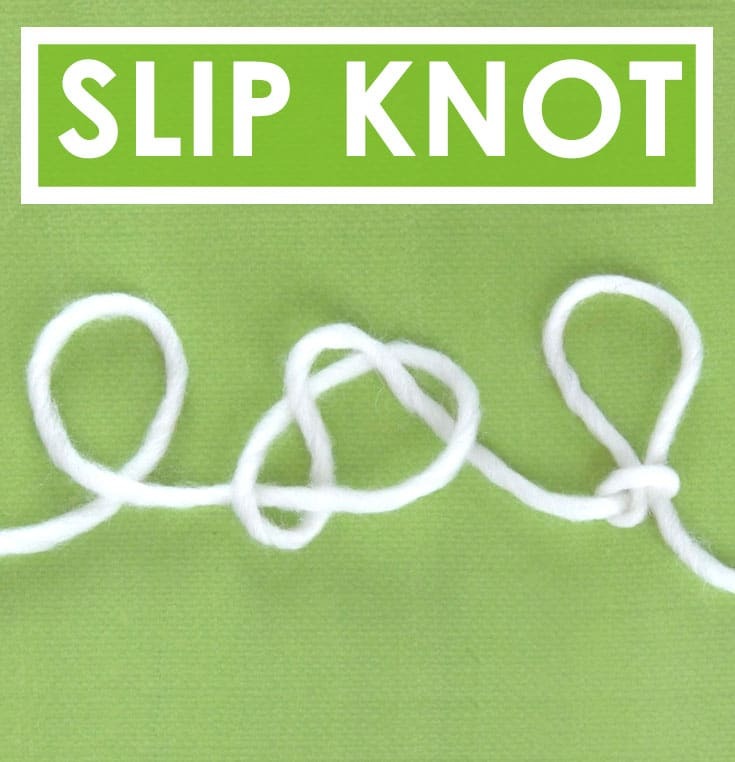 This yarn works perfectly for projects that will get wet because it is absorbent, lightweight, and easy to wash out when using as a dishcloth. 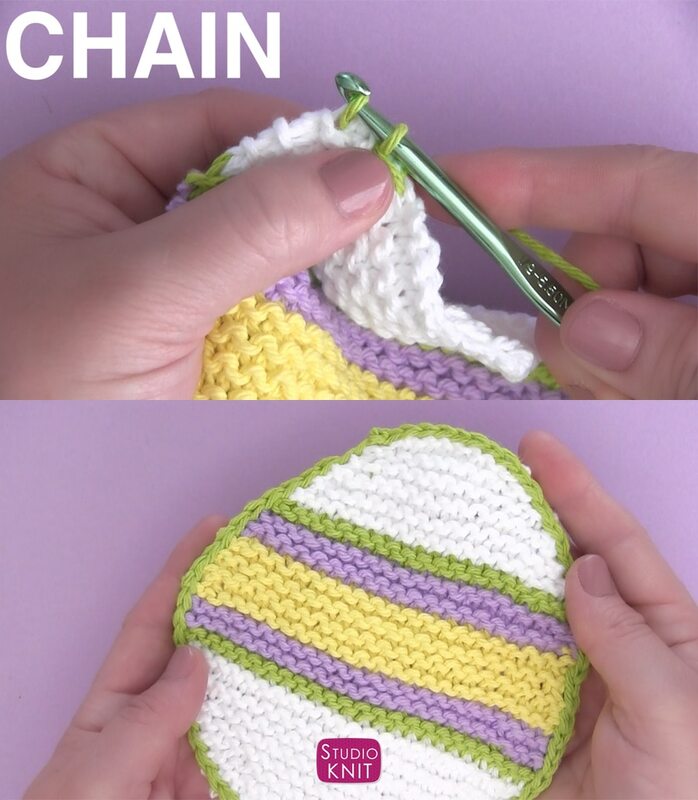 Using a crochet hook of comparable size to your knitting needles, you may wish to finish your work with a pretty little crochet chain border around the perimeter of your knitted piece. I find that it helps define the edges and gives it a more polished look. 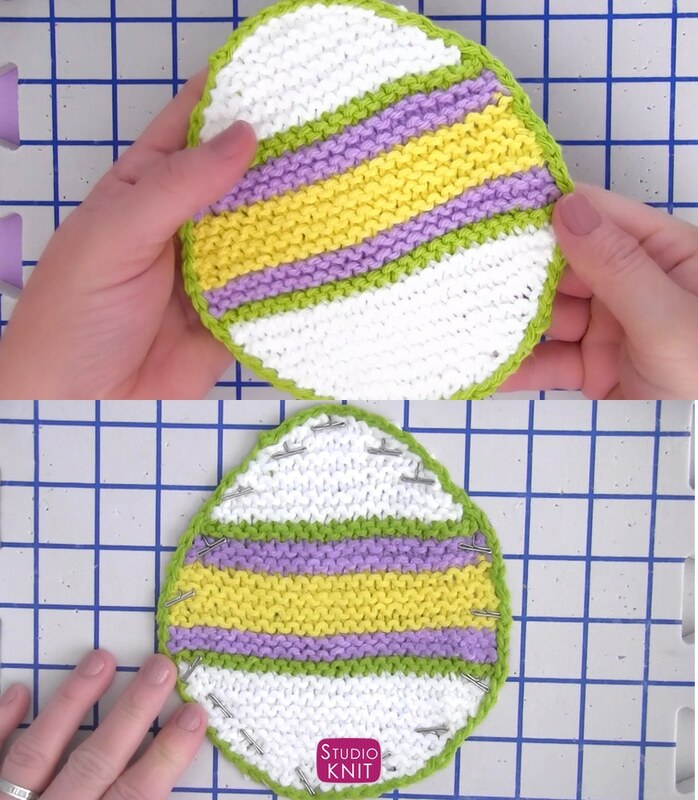 The Easter Egg shape really comes to life when you block it into shape. I like telling my yarn how to behave and wet blocking really helps establish the proper curves of your piece. Changing yarn colors: Always change yarn colors at the beginning of the right side (odd numbered rows) of your work. 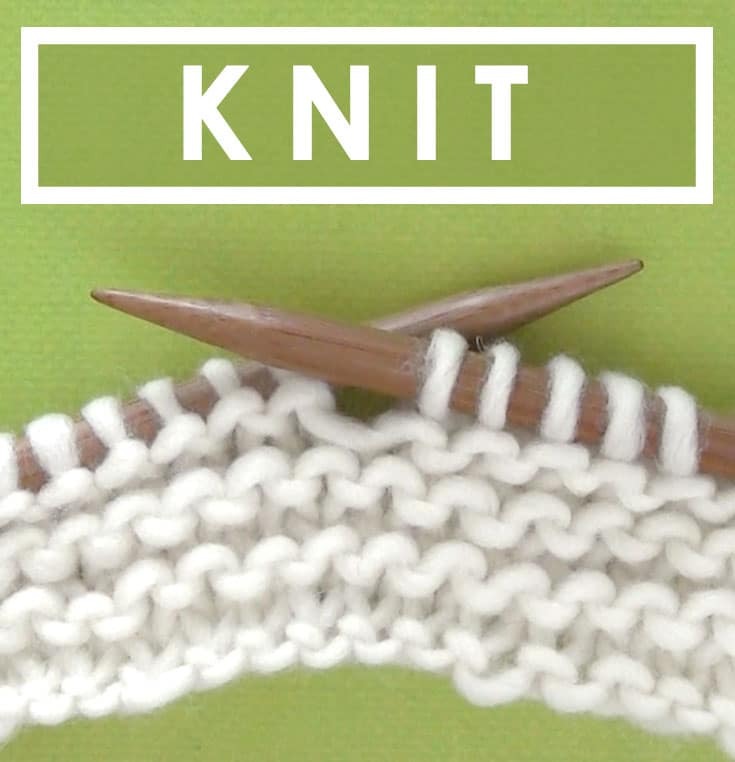 This will allow all of the purl dash lines to be on the wrong side of your knitted piece. 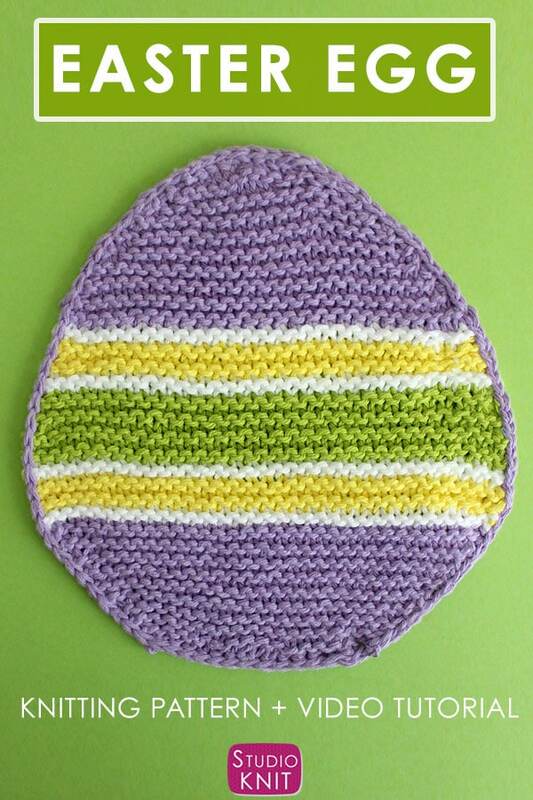 I hope you are inspired to knit up this Easter Egg Dishcloth for your next knitting project. 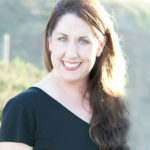 If you’d like even more, please make sure you join my mailing list. Subscribing to my YouTube channel Studio Knit is another easy way for us to stay connected and help support my work for free.